A few weeks ago we looked at a new batch of books recently published by McFarland. I touched on the obscure factor that some of their books tend to embrace and how they fill a niche spot in the baseball book market. Today we are going to look at a few more because honestly McFarland has a little something for every baseball fan. McFarland is always willing to publish team history books. Looking at both the powerhouse teams that are part of the baseball fabric as well as those that time has essentially forgotten. The year 1910 was an interesting point for the two teams involved in this volume and shows how it laid the groundwork for a streak that lasts to this day. The 1910 World Series brought us the end of one dynasty and the birth of another. The Chicago Cubs, coming off several very successful years and a win in the 1908 series were nearing the end of their reign. While Connie Mack’s Athletics were poised to start a championship run of their own. It was a fairly anti-climatic Series, but did offer an interesting historical note. For the first time in World Series history, game two to be precise, was the first time all nine starters recorded a hit in the same game. Its a neat little trivia factoid you can now impress all your friends with. This is a timely book with the Cubs poised to possibly end their World Series drought and also it allows the reader to travel back in time to see an entirely different generation of the game. Fans of either of these teams or of this era, will not be disappointed in this one. This one takes a look at the history of the Most Valuable player award in Baseball. It looks at the voting results and provides current statistical analysis to see what may have been different by todays standards. It is an interesting view as at what may have been overlooked by voters in the past as well as what other factors may have played into the voting results. It also shows how race may have been an underlying issue on some of the ballots. The book is a good mix of history, commentary and statistical analysis. For fans of these types of “what did we miss books” this is another one you will really enjoy. Finally, as the title says, Pud Galvin, not only the owner of an odd name was baseball’s first 300 game winner. Enshrined in the Baseball Hall of Fame in 1965, 63 years after his death, his numerous records and 300+ wins still did not keep him from dying penniless. One of the first real superstars of the game he had some amazing accomplishments on the field and helped grow the credibility of the early game. One of the other footnotes to Galvin’s story is he may have been the first user of Performance Enhancing Drugs in Major League Baseball. An advocate of using a monkey testosterone elixir, it seemed to enhance his on field performance. The difference from today to over 100 years ago is that everyone was on board with the use of the concoction. It shows a very different time in Baseball and quite honestly is a very interesting story for fans of the early eras of baseball. Someone Interrupted My Baseball Blog!!! It’s really no secret that I like baseball books. Up until recently I spent all my waking moments reading them while not working. The key part of that last sentence is “up until recently”. Something has gotten in the way of my reading and writing time and significantly made me cut down on my posts. Now I am realistic in the fact that probably no one other than a few publishers have noticed that I have not written much in the past two months and I realize there is not a single person out there thinking “Gosh, I miss Gregg’s amazing baseball book posts”. But this being a project I enjoy doing, I figured I would offer some explanation of whats going on. If you have followed this site over the last year, you have read about the forthcoming life changes, surgery and a trip that in the end was aborted for numerous reasons. Several weeks back the biggest life change arrived and since that very moment nothing has been the same in any way, shape or form. This little munchkin is the reason for all the mayhem. She arrived on August 18th (yes, I was reading Fastball John waiting for the delivery) and has disrupted our flow of life in so many wonderful ways. She has cut into my reading time and destroyed anything resembling a good nights sleep, but my Wife Brina and I are loving it in so many amazing ways. I have been working on her baseball book collection a few months before she arrived and thanks to Facebook friend Debby Brown, she received her first official Phillies book today. So her book collection is starting to come along very nicely. She doesn’t know it yet but she is a Phillies fan. Good or bad, that’s how this house rolls. We have had lots of early morning feedings with the baseball game replaying on the TV in the dark and that manicured green grass gets her attention every time. So I think we will have no problem raising another fan. ……….so it does slow me down a bit. But I promise everyone who sent me a book, your time will come. For those of you that have enjoyed this blog over the last two years I appreciate the support and look forward to many more books together. Its my love of baseball books that brought me to do this blog and I have been lucky enough to make some great new friends along the way as well. I have about 30 books on tap to get us through the Winter together, and hopefully Aubrey allows me a little more time to get them read. Either that, or she learns how to read sooner rather than later so she can help me out on the reviews. Wish me luck in figuring out parenthood. The only thing I know for sure is she can not date until at least age 35! Everything other than that is a work in progress ;). Sometimes even the best of us get fooled. While we try our hardest to know what we are getting ourselves into, sometimes the old bait and switch applies. I try to have a general idea as to what I am going to read before I start a new book, but it once in a great while will be the exact opposite. You can usually tell from the cover notes what a book is about, but then other times you are really not sure. Today’s book is one that I feel was not quite what it was supposed to be. This book was about the life of the Major League Pitcher Hank Aguirre. A durable pitcher for his time, he put up some respectable numbers but nothing Hall of Fame worthy. He also spent a great portion of his life after baseball dedicated to making the community around him a better place. These are all very nice sentiments for a local hero but unfortunately for someone looking for a baseball book this one would be considered a swing and a miss. 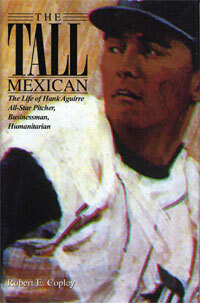 The book does briefly touch on Hank’s baseball career in the majors as well as his upbringing in the Hispanic community. It focuses largely on Hank’s post baseball career as a businessman and humanitarian. It shows how he was instrumental in bringing decent jobs to the Hispanic community in Detroit during a period of economic death. The details are great from a business standpoint and show the human side of this former baseball player. You get a sense of great compassion for his employees and great civic pride Hank was known for. If you’re looking for a good Baseball book this may not be the one for you. It is light on the details of Hank’s career and very heavy on his involvement in the business and Hispanic community. Over all it is a good book, it just misses the mark on being an actual baseball book. It’s that time of year where the playoffs are in full swing and the World Series is right around the corner. With the events over the next few weeks looming it is a time to write another chapter in the history books as well as reflecting on past seasons. The World Series has always been a source of great memories, as well as a few not so great moments. Some of those not so great moments have helped shape the game we all know today. The biggest one that has a World Series tie-in is the 1919 Black Sox scandal. It is an event that shook baseball to its core and todays book takes a hard look at what really happened almost 100 years ago. The 1919 White Sox were approached by gamblers to throw the World Series. Just about every baseball fan is familiar with the story, but its lasting effects have been felt throughout the game for almost a century. This particular series brought gambling to the forefront in baseball and essentially destroyed almost all of the credibility the game had with the general public. It also made the scape goat of the series Shoeless Joe Jackson a household name for generations to come. 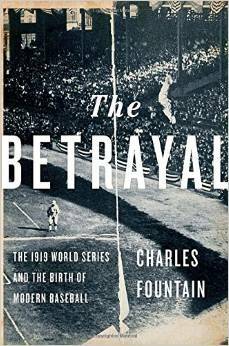 Charles Fountain takes a new and refreshing approach to the Black Sox scandal. The author removes the Hollywood glamorization of the Black Sox scandal and gives the reader the actual facts about what happened. He looks at the events from players, management and the gamblers aspects and paints a vivid picture for the readers of actual events. The details are so good in this book the reader can almost get the feeling they are a fly on the wall when all of this takes place. It does clarify some of the details that may have gotten blurred through the passage of time. There are other books out there that take a look at the 1919 Black Sox scandal. Some do a good job and some take poetic license if you will and blur the details. Thankfully, this one falls into the prior category and is one of the better books on the market. It forces the reader to look at the details objectively and to form some of their own opinions. The one interesting aspect is that you can see where the events helped transform todays game into what it is. You can see how leagues changed and the end result was the American League we now know. For fans who fancy themselves novice historians of the game, this book will be eye-opening and enjoyable. Pete Rose might even want to take a look at this one because he can see all the events that led up to the rules that banished him from baseball. It’s nice to see a book with fresh perspective almost a full century after the fact.